Shabbychick Junk. : I am DONE! YIPPIE! This cool shabby cabinet was a $5.00 steal of a deal that my Mom found at a garage sale. It got prettied up with all of my red aprons, and a red memo board, also from a garage sale that I paid $1.00 for. When I use the TV, I re-hang the memo board directly below it on 2 nails. My brilliant sister Gina had the idea of putting the TV in the middle shelf to free up counter space and hide it. She suggested curtains on the 3rd shelf. SOMEDAY! For now, the memo board will hold up just fine. 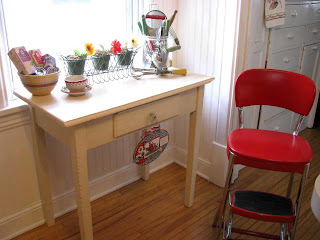 I got a not-too shabby deal on this skinny desk at Haupt Antiek market last weekend. It fits perfectly in this cubby so people can walk through comfortably. 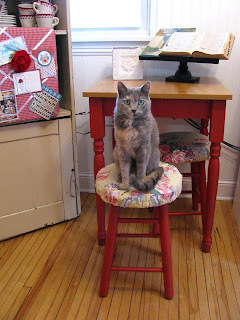 Here's Isabella, staking out her new shabby red painted stool & table. This used to be hunter green. My Mom sewed covers for the cushions out of some vintage yellow fabric (the curtains are from the same fabric). THANKS MOM! 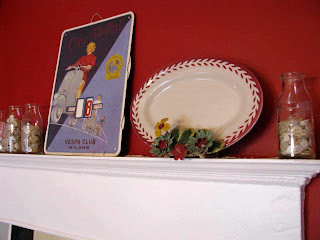 This cute plate holder was an expensive kitchen-warming gift from Mom. FIFTY CENTS! She finds the best deals. She also discovered that you can lean things up against the top of my door and window trims, on the ledge. Thanks everyone, for being patient with me during my kitchen remodel adventure! WOW ... the finished product is AWESOME!!! 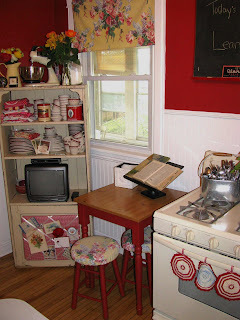 I can only imagine how happy you are in this wonderfully vintage kitchen ... enjoy!! You have inspired me to take a second look at my own kitchen. I'm thinking shades of purple (my favorite) and it would tie in with my "grape" themed diningroom. Whoo hoo! Your kitchen is so cutie cute cute! Love it. And your kitty is gorgeous, too; those eyes are stunning! Love your Kitchen...looks great!! I like the cabinets in their natural finish. check it out.. I have a shift there on Saturday afternoon. Love your butterfly card too...I LOVE all your cards. 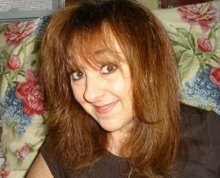 EVERYTHING is just DARLING Lisa!! It's gorgeous! I hope you have fun in your new kitchen. It looks absolutly fabulous. I love the way you hide the TV! It's absoultly shabb-a-licious! 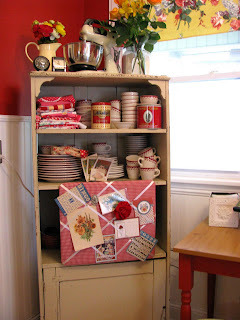 I love all you vintage goodies and I love the red! Your grey kitty looks so cute on the little stool! LZ!!! I swear you have the cutest crack house!!! 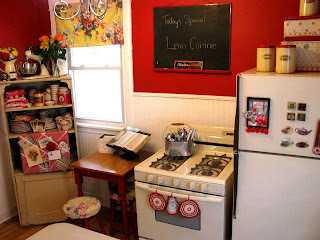 GORGEOUS Zappy, love your red kitchen and all your Zappy touches! I think you have a very happy cat! I so wish I could see it IRL again!! What a wonderfully "comfy" kitchen. Only a truly artistic soul can put together such an electic collection with such style and panache. PS Give Isabella a hug for me. Wow, it looks wonderful!!! I want to do something with mine but still not sure what. Isabella looks like a real sweetie! Your kitchen is SOOO CUTE!!!!!!! I love it!! 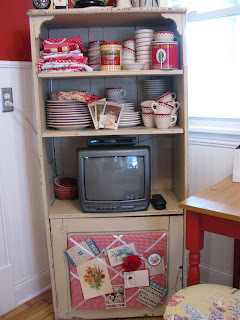 Your tv storage trick is quite lovely! Nice job! I love love love it! Wow! Congrats! 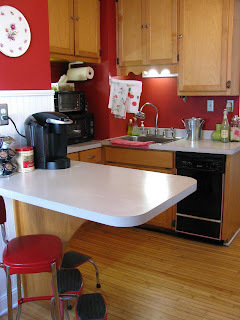 I want to paint my kitchen red so bad!!! I also want to find reproduction vintage fabric for the curtains...know just what I want, but of course can't find it. You're my shabby hero! LOL! It's wonderful, you have done a great job! Yipee! WoooHoo! I just love it!!! You can come over and redo our cabin any day!!! !